Adventist Church religious liberty director meets with government officials. As war-weary Colombia confronts the challenges of peace-building following decades of conflict with rebel groups, a Seventh-day Adventist leader has reminded government officials that minority religious groups have a valuable part to play. “An inclusive dialogue, one that draws in voices from all parts of Colombian society, will help foster a strong and lasting peace,” said Ganoune Diop, Public Affairs and Religious Liberty director for the Adventist world church, during a meeting last month with Colombia’s Minister of the Interior, Guillermo Rivera Flórez. Since the late 1950s, Colombia has endured ongoing unrest and violence as both left-wing insurgency groups and right-wing paramilitary organizations have fought against the government. The conflict was marked by the widespread use of torture, killings, and hostage-taking. According to reports, renegade groups also engaged in large-scale cocaine cultivation and drug trafficking as a way to fund their activities, which has in turn fueled the rise of powerful drug lords. According to estimates by Colombia’s National Centre for Historical Memory, the conflict has uprooted more than 5 million Colombians from their homes, and has killed more than 220,000 people—the vast majority of them civilians. Although a landmark peace agreement was forged last year between the government and rebel groups, the task of healing the scars of the past and building a new, post-conflict society is daunting. More than 80 percent of the Colombian population identifies as Roman Catholic, which, until 1991, was the official state religion. Although freedom of religion or belief is constitutionally protected in the country, Diop says members of minority churches in Colombia still sometimes find it difficult to have their voices heard within the broader public discourse. “These denominations, including the Adventist Church in Colombia, are eager to be productive partners in forging a more stable, inclusive, and peaceful society,” he said. 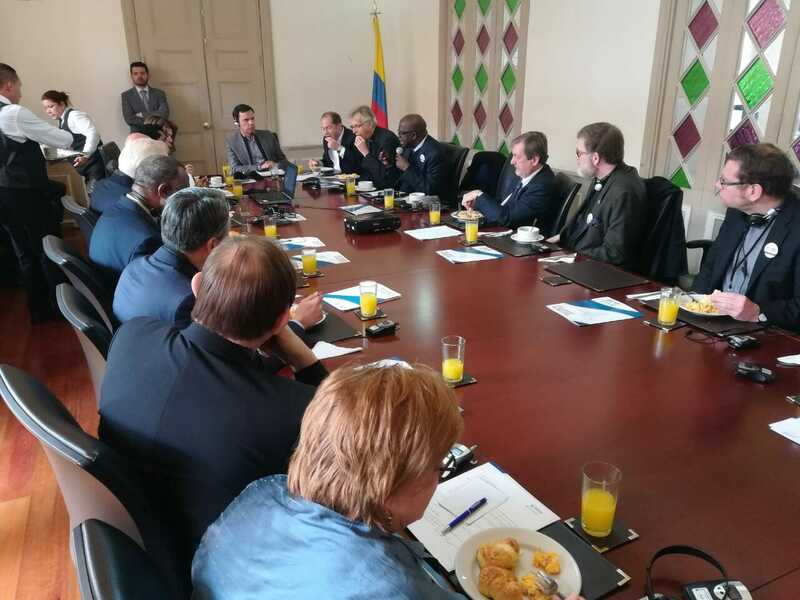 Diop met with Interior Minister Rivera as part of a delegation of global Christian leaders who were in Colombia for a meeting of the Conference of Secretaries of Christian World Communions (CS/CWC). The CS/CWC is an informal gathering of leaders from various Christian communions that meets in a different location each year for bilateral and multilateral conversations to dispel prejudice and hostility, and to share concerns, information, and news about their respective denominations. Diop has served as secretary of the CS/CWC since 2014, and the Adventist world church has been represented at these annual meetings for over 50 years.